Sometimes people read my stories aloud better than I do. Listen to Marguerite Kenner give a killer rendition of my story ‘There Are No Marshmallows in Camelot’ over at Cast of Wonders. Laticia Andrews, seven, accidentally catches the wizard Merlin in her princess house, like a bug in a bottle. Now she has some demands . . . This podcast marked a puh-retty darned important moment for me. When I first heard Ms. Kenner read my introduction and discuss my upcoming book from Simon & Schuster, I felt like an author for the first time. It was neat. Thanks, Marguerite. Everyone else, I hope you enjoy. 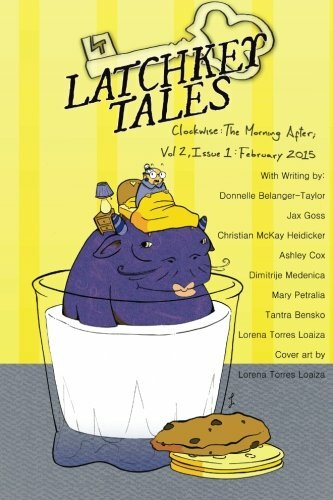 My story, The Gargoyle and the Grotesque, is now available to purchase in this manatee milk-covered edition of Latchkey Tales! The story is an argument between a gargoyle and a grotesque about whether to protect the tourists of the Biltmore Estate or let them be eaten by the demons in the surrounding woods.